3 posts categorized "Jazz History"
I must have been about 10 or 11 when I first caught the jazz bug. I had heard jazz on the radio, of course. It was still the 1940s and jazz and jazz-influenced music was still on the air. You could hear Gerry Mulligan, for example, on an afternoon music show Gerry and Chet Baker might be squeezed in between Frank Sinatra and Doris Day but they were heard as part of the music scene. 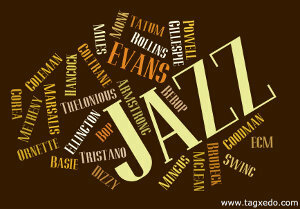 But I had no idea that there was a whole genre of music called jazz. However, one Sunday my uncle Jake asked me if I wanted to go with him to the Golden Grill to pick up a relative. I said why not. I think I was flattered that my dad’s youngest brother asked me to tag along with him and some other people. I was never sure whether my uncle liked me or not. Although he had a heart of gold, he could appear formidable. It was only a few years back that he was a decorated sergeant in army. I went along for the ride, little knowing it would lead to another ride that has lasted almost 70 years, the jazz train, which has been the ride of my life. We drove down to Charlotte and the Golden Grill. I was told to wait in the lobby because only adults could enter. When my uncle said stay, you did not question him or ask why. So, I stayed. The group was the Dixieland Ramblers. They had a steady gig at the Golden Grill in those days. It was earthier than swing or bop, both of which, especially bop, I have come to love. But at that time, it hit me heard, like a gut punch. I was quiet, for once. I was lost in thought. I wanted to hear more, and even more after that. Indeed, I have never been able to get enough jazz, never hear enough, know enough, or understand enough. Because I love jazz, I have learned more about European classical and romantic music as well as African music and various forms of American music. I still don’t know enough. I have written books and articles about jazz, and other forms of music, but I still do not know enough. As I grew older, I began to go to the Golden Grill and its successor, the Mardi Gras. I met many of my heroes. I even interviewed them and wrote about them. So many were so generous with their time and ideas. I studied music with one or two. I did so to know more about what they were doing. I never could come close to their skills. And it all began at the Golden Grill on Lake Avenue. Frank A. Salamone was born and raised in Rochester. He lived on the east side on Noth St. and then Clifford Ave., near Goodman St. Frank attended 25 School and Holy Redeemer, and went to high school at East High and Aquinas. He is a graduate of St. John Fisher (BA), the University of Rochester (MA) and SUNY-Buffalo (Ph.D). Frank left Rochester for many years but returned in Dec 2017. He has interviewed numerous jazz musicians over the years and has seen most of the greats. He has written articles and books on the music, including Music and Magic: Charlie Parker, Trickster Lives! (affiliate link) and The Culture of Jazz: Jazz as Critical Culture (affiliate link), plus several volumes on The Italians of Rochester, and a number of anthropological studies and other books. Note from Greg: Keep this conversation going by adding a comment below (either in the box if it's visible or click on the Comment link to get to it). This is just the first (in a long while) of what I hope will be many guest posts. I would love to get more voices into JazzRochester, writing about Rochester, its jazz history and future, the current jazz scene here, or the music in general. I'm wide open to ideas. If you're interested in being a guest author, just contact me through the Contact Us link at the top of the blog (or in the menu if you're on mobile). I look forward to hearing from you! Greetings from Chicago (I'm still here following a conference of lawyer geeks), where some of those roots may be found, but for Tom Morgan and many others, the deepest roots are of course found in New Orleans. Some of those roots were transplanted to the Windy City when King Oliver, Louis Armstrong and others came up here from NOLA. Morgan has produced sites that focus on the early years of jazz music, from 1895 to the 1920s and the foundation of this music in the culture and history of African-Americans. Morgan is a writer and radio producer, who hosts (at least at the time he did the site) the New Orleans Music Show on the legendary WWOZ-FM in New Orleans. As a musical language of communication, jazz is the first indigenous American style to affect music in the rest of the World. Brass Band From the beat of ragtime syncopation and driving brass bands to soaring gospel choirs mixed with field hollers and the deep down growl of the blues, jazz's many roots are celebrated almost everywhere in the United States. While my tastes run to jazz recorded in the last 50 years, I can't help loving the music from this early era of jazz. Its bubbling sense of joy belies the prejudice and struggle that many who played it found in their lives. It's powerful in that way, not nostalgic. All music should be considered within its own context and time. It may not be on my turntable all the time, but from time to time, I just need that sound of jasssssss. It is the first site added to my "Jazz History" category.